During the summer of 2016 a cycling survey was conducted in Taunton and the surrounding area. Over 300 surveys were received which led to Taunton Area Cycling Campaign presenting the findings to the local authorities. We asked people to feed back what they considered specific issues that either deterred people from cycling or made it difficult to cycle in certain locations. So far most mentioned: potholes ‘everywhere’, the cobbles in front of Market House, lack of provision on A38 from Wellington, safety on Station Road, condition of the canal towpath, lack of available cycle parking in the town centre (due to high demand), lack of information on the cycling network and missing links on it, problems with crossing J25, East Reach, Castle Street, lack of provision on A358 from Bishops Lydeard, along with many other problem locations. 60% of people were regular users, whilst 15% never or infrequently cycled. 2 top factors that would encourage people to cycle more were cycle friendly road design and better cycle paths. Better info about routes and bike security were also highly scored. The favourite reason choosing to cycle was flexibility /convenience. Health and environmental benefits also highly rated. Non car ownership was far less on a factor. About half of respondents reported theft of bikes or injury whilst cycling. 24% of people weren’t aware of the signposted cycle network and many people who were aware had only partial knowledge. 67% thought the network to be of some use, 8% very useful and 14% of no use. There were many comments about lack of joined up network, lack of signing and absence of maps. 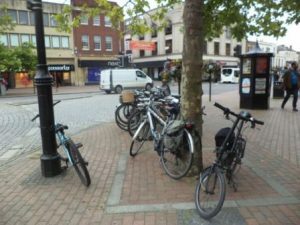 25% rated Taunton as good for cycle friendliness and 50% ok which seemed fairly positive in terms of promoting cycling. From the survey we identified fifty problem locations/issues and illustrated in a map, the top 15 were highlighted in a further map.